The canvas, despite being mould treated continues to be breathable and malleable, making the set up super easy and meaning that any creases in the canvas drop out very quickly. Available now for immediate delivery by courier from our Sydney warehouse. DOUBLE WALL – zipped mesh wall plus Canvas Wall. Waterproof. Our tents arrive with a waterproofing agent on them. The tent does need to be ‘seasoned’, where the tent is pitched and hosed down which allows the fibres of the canvas to expand and ensures that the tent becomes completely water tight. With time the tent will need to be re-waterproofed. With camping it can take many years before the tent will need to be re-waterproofed. If using in a semi permanent situation we recommend re-waterproofing every 4-24 weeks. PLEASE NOTE: The detailed photographs showing the mesh walls in place were taken inside a warehouse and the lights have given the canvas a greenish tone. 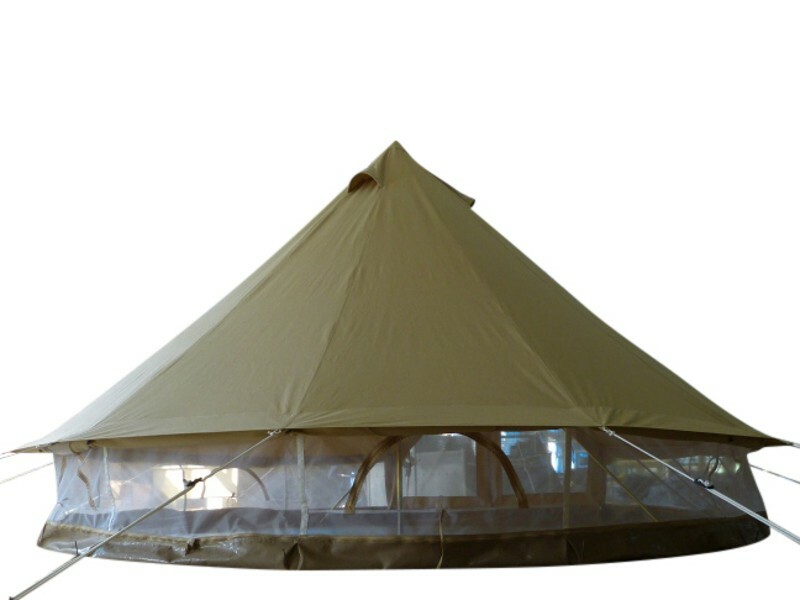 The canvas on all our bell tents is the natural sandstone colour of 100% cotton canvas.